In a small bowl, combine 1 tablespoon mustard, salt and pepper. Rub mustard mixture all over pork. In a large oven-proof skillet, heat oil over medium-high heat until hot. Add pork and brown on all sides, 3 to 5 minutes. Transfer skillet to oven and roast pork until a meat thermometer registers 145°, about 40 minutes. Remove pork from skillet and let rest for 5 minutes. Place the skillet over medium-high heat. Add vinegar and boil, scraping up any browned bits, about 30 seconds. Whisk in maple syrup and the remaining 2 tablespoons mustard; bring to a boil, reduce heat to a simmer and cook until the sauce is thickened, about 5 minutes. Add rosemary and stir to combine. Slice the pork. 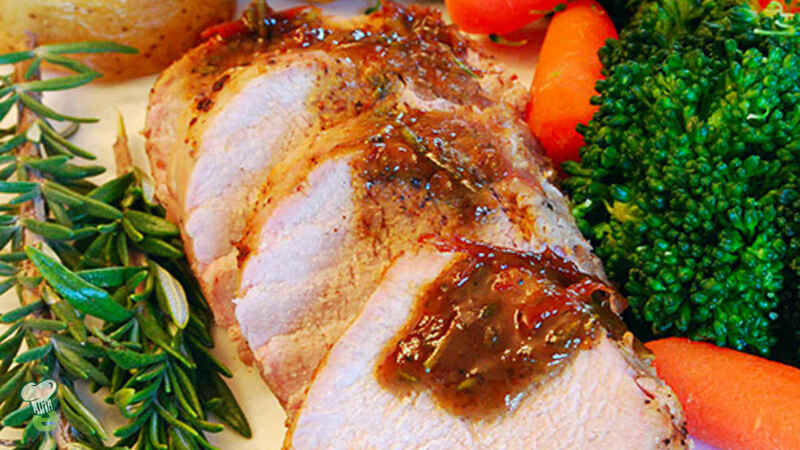 Serve the pork topped with the sauce.